Upon first sight there will be no doubt in anyone’s mind that this is a hacker’s keyboard. [Tim Tyler] built the odd-looking conglomeration of keys a few years ago with the goal of improving the man-machine interface. Why waste all that thumb space with just one long keyboard when you can have at least nine keys per thumb? After some additional consideration this isn’t all that unorthodox. We’ve seen keyboards that split the hands; in fact you can buy them. This just adds the thumb matrices and that rack of programmable keys above the alpha-numeric portion. It’s rather organ-like with its multiple ranks, don’t you think? Check out the demonstration video after the break. It certainly has a keystroke sound that is all its own. The sound is different from the clackity “M” keyboard and its modern relatives thanks to the microswitches that make up each key. 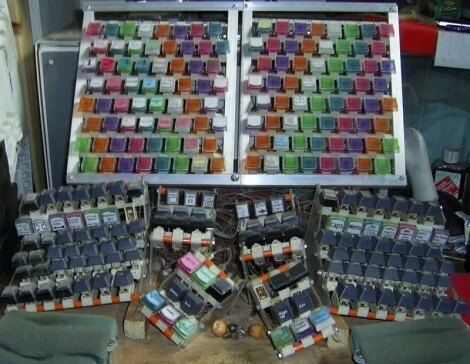 This may be the way to go if you that other scratch-built keyboard looks way too normal for your tastes. If they don’t find it handsome at least they’ll find it handy..
I’m going to an abandoned power station to try to get 104 of those huge knife switches and I’ll build a keyboard more manly than that. One helluva workout to send an email! 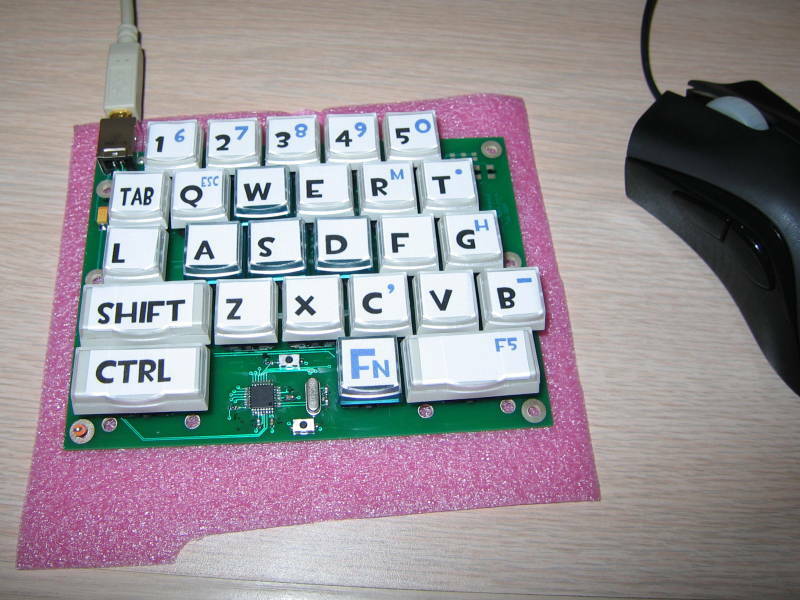 May have to leave the number pad off for space constraints…..
Then there’s the whack-a-mole keyboard i was working on…. I’m pretty sure I saw something on those lines; a giant pink chiclet-like keyboard with circular pads to be struck with a mallet. Does anyone out there have a link to that? I can’t find it again. I have an IBM Model M keyboard that sounds like that and at home, no problems … at work, your co-workers WILL want you dead within a day. In middle school we had a computer lab full of machines with buckling spring keyboards. Clickitty-clackitty-clack. I love that sound. Ha! I have one at work… People haven’t complained yet, and I reaaally go at it… Nothing more satisfying than making lots of noise while you work sitting down at a desk.. 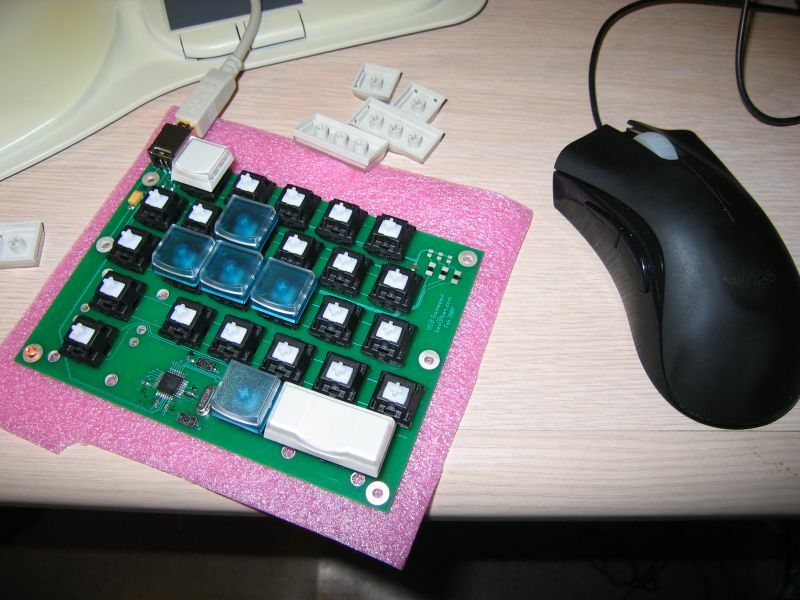 This is going to be far, far quieter than a Model M.
This is using microswitches – basically, the switches found under mouse buttons. With a USB AVR (like AT90USB162) and the LUFA library it is very easy to make a keyboard device that will plug’n’play on Windows, Linux and Mac. I want to see him actually working on something. Agreed, unless he’s a ridiculously fast typist and he uses that big programmable array all the time, I don’t think this is worth the extra buttons. Notice he is eating it outside. I’ve been in hotels that allow smoking, but ban Durians, because they stink up the rooms so much. Wow, wasn’t this reminiscent of the computers in the movie “Brazil”? All he needs is a large flat Fresnel lens in front of a tiny, open-frame B&W deathtrap monitor. Love it. whoa, you wanna blow you mind, watch this guy’s video on tri-axial weaving… who knew? so how many of you also dumped their model M 15 years ago? I just bought a unicomp customizer this year! With thumb buttons, you’ll stress out your thumbs pushing down, especially with so many positions. Ideally you’d be pushing sideways with your thumb (like on buttons found on the side of some mice). I LOVE “clicky” keyboards, and his emphasis on tactile response is dead on. Mushy keyboards are the worst. I was just espousing yesterday (to my wife) the virtues of the old clicky keyboards I used to use in the public library during my middle school years. After seeing this, I’m thinking that my reminiscence more than me being old, but that there is something…appealing…about that sound. Maybe hardware manufacturers could bring that back?